Objective: To update the follow-up of the Euro-Lupus Nephritis Trial (ELNT), a randomised prospective trial comparing low-dose (LD) and high-dose (HD) intravenous (IV) cyclophosphamide (CY) followed by azathioprine (AZA) as treatment for proliferative lupus nephritis. Patients and methods: Data for survival and kidney function were prospectively collected during a 10-year period for the 90 patients randomised in the ELNT, except in 6 lost to follow-up. Results: Death, sustained doubling of serum creatinine and end-stage renal disease rates did not differ between the LD and HD group (5/44 (11%) vs 2/46 (4%), 6/44 (14%) vs 5/46 (11%) and 2/44 (5%) vs 4/46 (9%), respectively) nor did mean serum creatinine, 24 h proteinuria and damage score at last follow-up. Most patients in both groups were still treated with glucocorticoids, other immunosuppressant agents and blood pressure lowering drugs. After 10 years of follow-up, the positive predictive value for a good outcome of an early drop in proteinuria in response to initial immunosuppressive therapy was confirmed. Conclusion: The data confirm that a LD IVCY regimen followed by AZA—the “Euro-Lupus regimen”—achieves good clinical results in the very long term. Many therapeutic trials in the field of lupus nephritis report short- or medium-term results.1 2 3 4 Nevertheless, we know from the National Institutes of Health studies that differences in outcomes such as death or end-stage renal disease (ESRD) become significant only after a follow-up period of more than 5 years.5 6 7 8 Therefore, long-term reports on prospective studies are needed to validate the initial conclusions and to learn more about the natural history of the disease. The purpose of the current analysis is to update the follow-up of patients randomised in the ELNT at 10 years. Between September 1996 and September 2000, 90 patients fulfilling the classification criteria for systemic lupus erythematosus (,11 aged ⩾14 years, with biopsy-proven proliferative (WHO class III, IV, Vc or Vd) lupus glomerulonephritis and ⩾500 mg 24 h proteinuria were included in the ELNT by 19 European centres. Inclusion/exclusion criteria have been described elsewhere.9 Of the 90 patients, 22% presented with renal impairment and 28% with nephrotic syndrome. The study was approved by the ethics committees of all participating hospitals and written informed consent was obtained from all patients. The study did not received external funding or sponsorship. All patients received three daily 750 mg IV methylprednisolone pulses, followed by oral glucocorticoid (GC) therapy at an initial dose of 0.5 mg equivalent prednisolone/kg/day for 4 weeks. After 4 weeks, GCs were tapered by 2.5 mg prednisolone every 2 weeks. Low-dose GC therapy (5–7.5 mg prednisolone/day) was maintained at least until month 30 after inclusion. Patients assigned by minimisation to the HD group received eight IVCY pulses within a year—that is, six monthly pulses followed by two quarterly pulses. The initial CY dose was 0.5 g/m2 of body surface area and the subsequent doses were increased by 250 mg according to the white blood cell count nadir measured on day 14,12 with a maximum of 1500 mg per pulse. Patients assigned to the LD group received six fortnightly IVCY pulses at a fixed dose of 500 mg. In both arms, AZA (2 mg/kg/day) was started 2 weeks after the last CY injection and prescribed according to protocol at least until month 30 after inclusion. After this period, the decision to stop or continue immunosuppressive treatment (including a decision to prescribe additional IVCY) was left to the discretion of the caring doctor. Hypertension (diastolic blood pressure ⩾90 mm Hg) was treated with angiotensin-converting enzyme inhibitors (ACEI), unless contraindicated. Prescription of ACEI was not allowed as antiproteinuric therapy within the first 6 months in normotensive patients. Serum creatinine was measured regularly (ie, quarterly) in 84 patients; six were lost to follow-up. Renal impairment was defined as a serum creatinine ⩾1.4 mg/dl. Major events such as sustained doubling of serum creatinine, ESRD, cancer, cardiac or arterial event or death were prospectively reported to the coordinating investigator (FAH). The Systemic Lupus International Collaborating Clinics/American College of Rheumatology Damage Index (SLICC/ACR DI) was measured at last follow-up for the purpose of this report. All consecutive immunosuppressant agents prescribed were recorded. Survival curves were derived using the Kaplan–Meier method and were statistically tested with the log-rank test. We calculated the hazard ratios and their 95% CIs using the univariate Cox proportional-hazards model. Patients dropped from the trial were included in Kaplan–Meier analyses (intention-to-treat analyses). Unpaired t tests, χ2 tests with Yates’s correction and analysis of covariance were used as appropriate. Of the 90 patients randomised in the ELNT, only six were lost to follow-up, after a mean duration of 10 years. Table 1 and fig 1 show that the probability of death, ESRD and sustained doubling of serum creatinine did not statistically differ between the HD and LD IVCY groups. Seven patients died within 10 years, three from sepsis (age in years/months since randomisation: 27/53, 42/86 and 67/60), one from active lupus disease (14/1), one from aortic aneurysm (61/94) and two from an unknown cause (52/105 and 54/43). Interestingly, only 12% of the patients reached a sustained doubling of serum creatinine and 7% had ESRD. Of the six patients with ESRD, three had a renal transplant, two died and one is receiving haemodialysis. Kaplan–Meier analysis of the probability of an absence of death (A), end-stage renal disease (ESRD) (B) or of sustained doubling of serum creatinine (SDSC) (C). Patients were randomised to a low-dose (LD) or a high-dose (HD) regimen of intravenous cyclophosphamide, followed by azathioprine. Survival curves were statistically tested with the log rank test. HR: hazard ratio (95% CI). Numbers shown along the abscissa are the number of patients at risk in each group. Analysis was by intention-to-treat. Table 2 shows that serum creatinine and 24 h proteinuria at the last follow-up did not differ between the two treatment arms. The majority of patients were still treated with GCs (mean (SD) daily prednisolone dose:5.5 (1.7) mg) and/or another immunosuppressant agent. At last follow-up, two-thirds of the patients were taking a blood pressure lowering drug, mainly an ACEI/ARB (87% of the patients were receiving antihypertensive drugs). After completion of the protocol or after drop-out, patients received, within a 10-year period, a mean of 0.7 immunosuppressive drug/patient in addition to the per protocol regimen (ie, one course of IVCY followed by AZA). Details of the additional immunosuppressant agents prescribed are given in online supplementary file 1. One-third of the patients were ever treated with mycophenolate mofetil. Despite some patients allocated to the LD IVCY regimen receiving additional IVCY therapy, the mean cumulative IVCY dose remained statistically lower in the LD group (5.5 g) than in the HD group (9.5 g; p<0.001 by unpaired t test). Of note, 68% of the patients randomised to the LD IVCY arm did not receive more than the per protocol IVCY regimen—that is, 3 g. As detailed in online supplementary file 2, baseline mean serum creatinine, serum albumin and 24 h proteinuria of patients allocated to LD IVCY who later required additional IVCY did not statistically differ from patients who did not. The SLICC/ACR DI did not differ between the two IVCY groups (table 2). Seven patients (four HD and three LD; NS) had a cardiac or arterial event: two myocardial infarctions (aged 34 and 54 years), two cerebrovascular accidents (aged 20 and 72), one angina (aged 56), one aortic aneurysm (aged 61) and one popliteal artery thrombosis (aged 32). Cancer was diagnosed in seven patients (six LD and one HD; p = 0.10 by χ2 test with Yates’s correction), after a median (range) follow-up of 100 (11–147) months: two breast cancers (aged 53 and 57 years), two cervix cancers (aged 30 and 41), one squamous skin cancer (aged 55), one thyroid carcinoma (aged 41) and one Burkitt lymphoma (aged 37), the latter in a patient who had received a kidney transplant. Reproductive rates were similar in the LD and HD groups. Thus, 19 pregnancies (nine in the HD group and 10 in the LD group) were successful in 14 patients (six in the HD group and nine in the LD group). We have previously demonstrated that an early response to initial immunosuppressive therapy predicts long-term renal outcome and we wished to assess whether this effect was still present after 10 years of follow-up. Patients for whom follow-up was available (n = 84) were therefore divided into patients with a good (n = 65) or poor (n = 19) long-term renal outcome according to their last serum creatinine value (<1.4 mg/dl vs ⩾1.4 mg/dl, respectively). Of note, the proportion of patients with a poor renal outcome was similar in the LD (22%) and the HD groups (23%; p = 0.999 by χ2 test with Yates’s correction). Figure 2 shows that the 24 h-proteinuria significantly dropped at 3 and 6 months compared with baseline only in the subgroup of patients who experienced a good 10-year renal outcome (p<0.001 by analysis of covariance with baseline 24 h proteinuria as covariate), thereby confirming that an early response to immunosuppressive treatment is a valuable prognostic marker. Differential kinetics of 24 h proteinuria drop in patients with a good and poor long-term renal outcome. 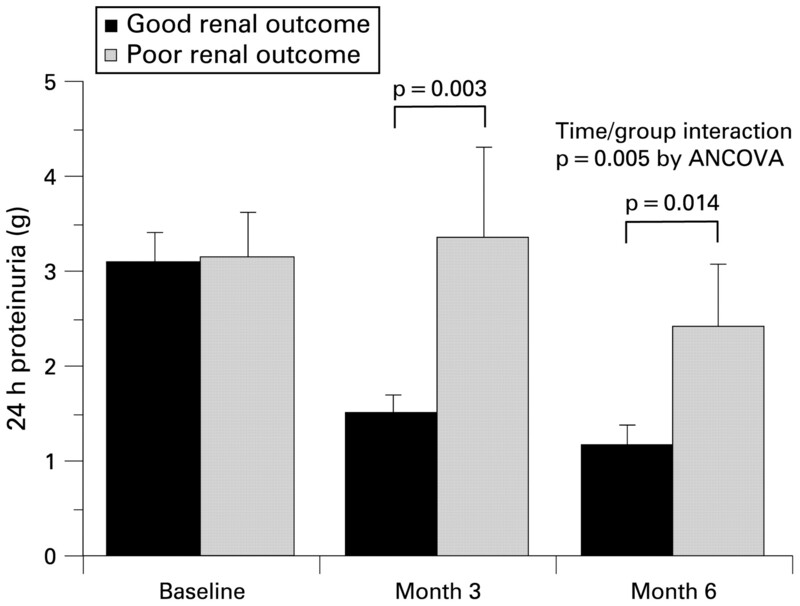 Data are shown at baseline and after 3 and 6 months of treatment for patients with good long-term renal outcome (serum creatinine at follow-up <1.4 mg/dl; n = 65) and poor long-term renal outcome (serum creatinine ⩾1.4 mg/dl; n = 19). p Values indicated above the columns were calculated by unpaired t tests. The p value of the time/group interaction was calculated by analysis of covariance after adjustment for baseline 24 h proteinuria. In this manuscript, we report the long-term follow-up of a randomised lupus nephritis trial comparing two IVCY regimens. In this European (mainly Caucasian) patient population, presenting with moderately severe disease,9 we confirm that a LD IVCY regimen followed by AZA (now referred to as the “Euro-Lupus regimen”) achieves good clinical results in the very long term. It is remarkable that almost 70% of the patients randomised to the LD IVCY arm did not receive any additional IVCY pulse during a 10-year period. The death and ESRD rates are low in this cohort of patients with lupus nephritis. One might correctly argue that such a good outcome is related to low renal disease activity at baseline and to under-representation of certain ethnic groups, since most patients had early renal involvement and were Caucasian. However, our data mirror those of the patient population we currently treat in our European lupus clinics. Our survival rate (92% at 10 years) is indeed well in line with that seen in a large series of 1000 European lupus patients followed up in a prospective observational study (88% survival at 10 years in the nephritis subgroup).13 Among other explanations for a fair outcome, we would like to emphasise that two-thirds of the patients were still immunosuppressed with low-dose GCs and that half were still taking another immunosuppressant agent 10 years after the initial treatment of lupus nephritis. Critically, given that uncontrolled hypertension is a powerful predictor of poor outcome, most patients were still receiving antihypertensive therapy, mainly with ACEI/ARB at follow-up. Our data therefore suggest that very long-term immunosuppression with close monitoring, combined with optimal blood pressure control and anti-proteinuric therapy, may contribute to the good global and renal outcome in the ELNT and could be considered the standard care for this patient group. Nevertheless, we suggest that early recognition of renal involvement, together with an experienced multidisciplinary approach linking several specialties such as rheumatology, nephrology, internal medicine, infectious diseases and intensive care medicine plays a critical role in the optimal management of patients with lupus nephritis. Although the difference was not statistically significant, more cancers were unexpectedly seen in the LD IVCY group. Theoretically, by inducing a lower degree of immunosuppression, a LD IVCY regimen might account for the persistence of a chronic inflammatory state that purportedly favours the onset of malignancies.14 Two lines of evidence, however, argue against this possibility. First, the two treatment regimens differed from each other only during the first year (all patients were switched to AZA thereafter), while most malignancies appeared much later. Second, we analysed whether the incidence of cancers was correlated—or not—with a history of lupus flare (ie, uncontrolled inflammation) during the first 3 years of follow-up (during which flare data were prospectively collected). Malignancies were not more common in the subgroup of patients who experienced at least one lupus flare (two cancers in 29 flaring patients; 7%) than in the subgroup who did not (five cancers in 61 non flaring patients; 8%). Finally, and importantly, we confirm the prognostic value of an early response to treatment for a good 10-year renal outcome, as we previously demonstrated in the same group of patients after a shorter follow-up.10 This observation has practical clinical implications. Thus, faced with a patient with lupus nephritis with an excellent initial response to treatment at 6 months, we could cautiously predict good long-term renal outcome with continued immunosuppression. On the other hand, when a patient does not respond at all at 6 months, our data indirectly suggest that a change in treatment could be considered, in the context of additional information regarding disease activity, such as extrarenal disease or serological activity, the more so as the armamentarium of immunosuppressant agents used to treat lupus nephritis has recently been broadened.1 2 15 16 17 Thus, a patient initially treated with IVCY and not showing a fair clinical response at 3–6 months (eg, a 50% reduction in 24 h proteinuria) should probably be switched to another treatment, such as mycophenolate mofetil, rituximab or ciclosporin A, although no prospective data currently support this proposal. Taken together, the 10-year follow-up data of the ELNT confirm and further extend the initial observation that a LD IV CY regimen followed by AZA is an alternative to the classical HD long-term NIH CY regimen.
. Early response to immunosuppressive therapy predicts good renal outcome in lupus nephritis: lessons from long-term follow-up of patients in the Euro-Lupus Nephritis Trial. Arthritis Rheum 2004;50:3934–40.
. Management of lupus nephritis. Kidney Int Suppl 1996;53:S88–92.
. Inflammation, a key event in cancer development. Mol Cancer Res 2006;4:221–33.
. Management of lupus nephritis: an update. J Am Soc Nephrol 2004;15:2694–704.
. Current treatment of lupus nephritis. Lupus 2008;17:426–30. Dr J Font has died and the authors dedicate this paper to him. Ethics approval Ethics approval from Cliniques Universitaires Saint-Luc, Université catholique de Louvain. Patient consent Patient consent was received.